The Volvo 264 was presented in the autumn of 1974, and two years later it was time for Volvo's first six-cylinder estate: the 265. But that was far from the end of it - at the Geneva Motor Show in March 1977, perhaps the most unexpected model version saw the light of day: a two-door coupé with heavily slanting windscreen pillars and the roof lowered by 60 mm. To get the car to be perceived as sleeker, the rear spare wheel pods had been removed - the remainder of the body was identical. When the Volvo 1800ES was discontinued in 1973, there was no natural successor to the role of top range sports model. Volvo's CEO Pehr G Gyllenhammar saw this as a problem. It was especially important that there was a model of this kind in Volvo's biggest export market in the USA and a luxury coupé seemed more right at the time than another sports car. 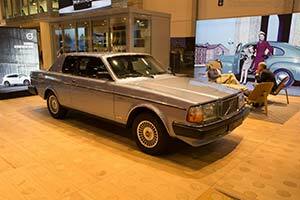 Volvo's chief designer Jan Wilsgaard did sketches for the shapes of the prestige car, but no clay model was ever built. Instead, he used a Volvo 164 that had been used to test new interiors. It was taken to the Italian designer Sergio Coggiola's company in the Italian city of Turin, where the four-door body was rebuilt into a two-door body with a lower roof. The roof was clad with vinyl and the wide C-pillar adorned with three crowns - Sweden's heraldic national symbol. The three crowns were replaced by slightly larger ones on the production car, which is one of the very few differences between it and the prototype - except the obvious one that it was based on a 164. The engine in the 262C was initially a 2.7 litre, 141 hp V6. It was shared with all the other body versions in the 260 series and had been developed together with Peugeot and Renault. Manufacturing took place in Douvrin in France under the auspices of the Société Franco-Suédoise de Moteurs-PRV company. Volvo's engine designation was B27E and thanks to engine blocks and cylinder heads made from aluminium, it weighed less than 150 kg. Such a niche product, built in small numbers, didn't fit into the Volvo plant in Gothenburg. Instead, final assembly took place at the Italian Carozzeria Bertone, who also built the 264TE limo. Kits were sent to Turin where the bodies were modified, painted and assembled into finished cars. A small badge on the lower edge of the front windscreen showed that Bertone had built the car.